Summer is over, fall is in full swing, and the weather is beginning to turn cold. Some days it almost feels like it’s winter already! That’s when we start thinking of warm comfort food, something hearty and tasty to fill our tummies and make us feel better—something like… stew! Thank You, Omu! 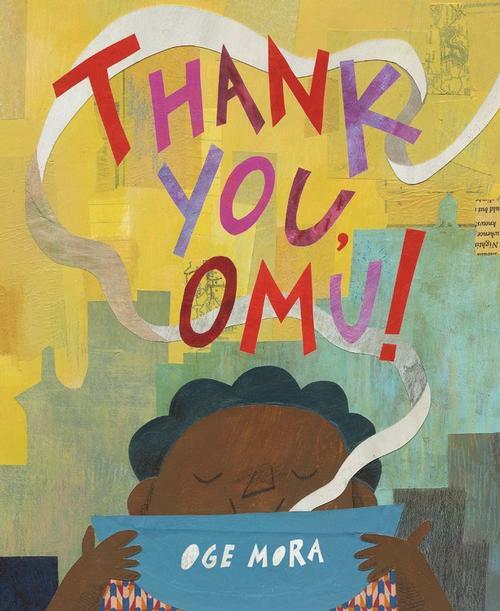 by Oge Mora is just what one needs to feel the warmth and coziness of home, and it’s our choice for this installment of Picture Book Highlights, a series where we put the spotlight on a book that has been ordered for all neighborhood libraries. Ms. Mora was inspired by her own grandmother whom she called "Omu" (pronounced AH-moo, for Igbo for queen). Like her grandma, Omu cooks the most delicious stew! No one in the neighborhood can resist its mouthwatering aroma as it travels from her kitchen and into the street. Soon, everyone appears at Omu’s home, and she’s more than happy to share. One by one, everyone tastes a little bit of Omu’s stew, until finally there’s nothing left. What will Omu do about dinner? It’s a lovely story of community, neighborliness and generosity, done in beautiful mixed media art: cut paper collage layered with paint and pastel. A reward to all senses! Add a Comment to Picture Book Highlights | Thank You, Omu!